RESERVATIONS ARE NOT NEEDED MONDAY THROUGH THURSDAY. For large or special event bookings, please email bookings@malibuwines.com. Seating for a maximum of 10 guests. 3 hour reservation; multiple time slots may be purchased for a longer reservation time. Once your reservation has ended, you will need to exit the tasting room. Malibu Wines does not provide any alternate non-alcoholic beverages. You will be responsible for brining any additional supplies needed during your reservation. A 2 bottle minimum purchase will be required once you arrive at the tasting room. Cancellation/Refund Policy: In the event of cancellation, Malibu Wines will refund in full with a 5 day notice. If applicable notice is not given, you may still cancel and will be issued a voucher to use towards a future booking. All food purchases will not be a part of the voucher. Alcohol: The Malibu Wines Tasting Room proudly serves Semler and Saddlerock Wines. All bottle purchases will be in addition to prices quoted above. All alcohol enjoyed on property must be purchased through the Malibu Wines tasting room. Absolutely no outside alcohol is allowed on property. Food: All events held at Malibu Wines can be catered to meet your specific needs. We gladly allow groups to bring their own prepared food and picnics. Catering is available upon request with our preferred catering vendors. If you are interested in bringing in an outside caterer, please contact bookings@malibuwines.com prior to booking. Set Up: All tables and chairs for your event must be provided by Malibu Wines or by request from one of our preferred vendors. Music: With respect to our other patrons and live music performers, we kindly request that you do not bring in outside music or PA system. 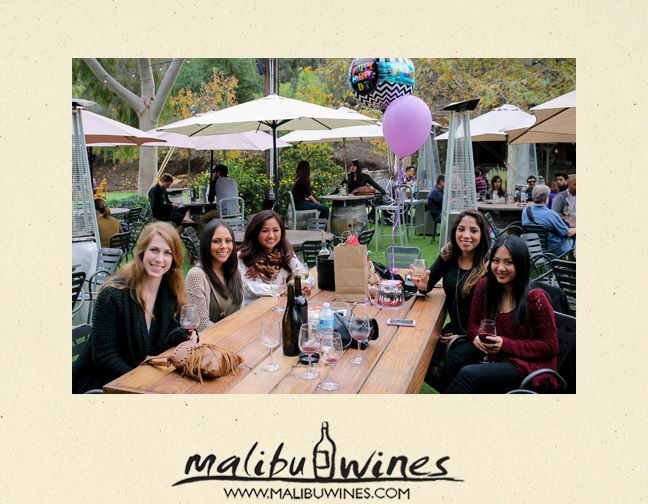 Minors: Malibu Wines tasting room is a 21 and over facility at all times. All guest must be of legal drinking age at all times.